This article was originally published on 3 February 2014, but has been updated for freshness. Not quite sure what to do with that special someone? Well… take him or her to Paris, firstly. That’s always a good place to start. But let’s be honest: champagne at the top of the Eiffel Tower is just a liiiiiittle passé, isn’t it? I mean, it’s not bad. It’s just predictable. And don’t you want to sweep your sweet off his or her feet? I am all for romantic yet one-of-a-kind gestures. That’s why I put together this list and now you – yes you! – can take advantage of it too. Check out these 7 romantic and off-the-beaten-path Paris activities. Whether you like to eat, drink, sightsee, or just lounge around in a beautiful place, these original ideas won’t disappoint. There are many, many wine bars in Paris. But wine and high-quality tapas hasn’t really taken hold yet (because olives and peanuts do not count as tapas, people). For this, head to La Rallonge in northern Montmartre. This isn’t the tourist Montmartre, either – bonus points for you! The restaurant is just north of the butte and the neighborhood has a more intimate feel to it than other parts of Paris. Before dinner, stop by the charming cobblestoned Poteau market, see (or climb) the rarely-taken steps up to Sacre Coeur on the Passage Cottin, or rest your legs in the beautiful Square de Clignancourt. You’ll not likely hear much English in this area of Paris, as it’s primarily locals. Now that you know what makes the neighborhood unique, Nothing is lovelier than tasting half the menu, splitting each plate with your sweetie. The amazing wine list (chalked on the wall) will keep you busy if you have to wait for a table. La Rallonge is quite small, so be sure to make a reservation. Looking for a spot to enjoy a post-dinner drink? For nice cocktails head to Sunset (100 rue Ordener 75018), for a jaw-dropping beer selection at a local dive go to Supercoin (3 rue Baudelique 75018), and for a convivial ambiance – and often live music in the cellar – head to Le Cave Cafe (134 rue Marcadet). Bonus: afterwards, walk up the steps at Passage Cottin to Sacre Coeur Basilical, and take in the view over all of Paris! Sweets for the sweet, they say… well, you’re going to love hearing about this Parisian food tour. Take this to a whole new level with your beloved by exploring some of Paris’ best desserts one morning, with a guide who will take you into all the best shops. This The Sweet Street tour will do just that. From Bastille to near the gorgeous Hotel de Ville, you’ll visit 6-7 different sweets shops… and yes you get to taste the specialties at each one! Did you know that every region of France produces honey? You’ll not only learn that on the tour but also will be able to taste the differences. Plus there are other delicacies to try… champagne honey or lavendar caramel, anyone? Artisan madelines, whipped-cream meringue puffs, classic pastries, chocolates, and of course who could forget the famous macaron? You’ll try them all, along with a little bubbly surprise as well. This is a great opportunity to learn about what you’re eating and make sure you’re getting the good stuff, instead of haphazardly wandering into shops and hoping it’s good quality! There are so many bakeries and sweet shops in this city… and not all of them are great. Bonus: Get a special 10% discount on this sweet food tour with the discount code ROMANCE10 ! How about a little strolling privacy? The Village St. Paul is unknown even to many Parisians. Nestled between rue des Jardins St-Paul and rue Saint-Paul just south of rue Charlemagne, the Village St Paul is a welcome respite from the normal bustle of Parisian streets. It’s a series of interconnected courtyards (allowing you to enter on any street mentioned above) which house an incredible antique, art, and artisan market. There are even restaurants, including a wonderful little Italian place that sometimes has live jazz, called Pinot Grigio (open every day from 11am-11pm). Of course the nicer the weather, the more people you’ll see dining and wandering the courtyard… but believe me, this charming little place is still serene and beautiful. Steal a few kisses in this secluded and tranquil spot… you’d never believe you’re in the middle of the city! Bonus: 5 minutes away is the amazing eclair shop Éclair de Génie (14 Rue Pavée) – grab a sweet to enjoy with your sweetie while you explore. The least under-the-radar activity on this list, I wouldn’t suggest this to you if my own personal experience hadn’t blown me away. Live classical music in the most beautiful chapel in the world? Now, that is a classy start to a romantic night. Plus, you get to visit the Sainte-Chapelle after the general opening hours. That means the only other people in there will be other concert-goers. This is a fabulous and special way to see the famous monument without loads of tourists around. Hugely important Parisian monument, without crowds of tourists? That’s unique all in itself. So go ahead… wow your honey with this VIP experience. 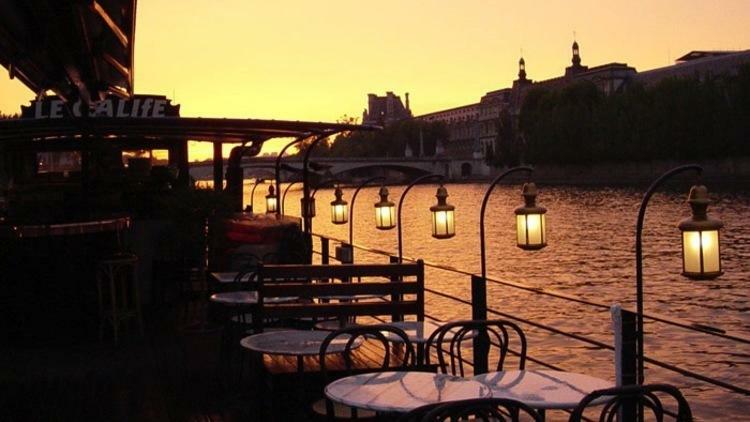 Something about the Seine river is so romantic, it just makes you want to cozy up to your special someone. Boat rides are a perfect way to do this AND knock out some great sightseeing at the same time… but those touristy historical commentaries can really kill the mood. Enter: dinner cruise on the Seine river. There are a couple big companies that do this… and they don’t do it very well. The ships are huge (getting a window seat is not always easy) and the food isn’t great. Well, it’s good, but it’s clear that you’re paying for the scenery. Don’t get me wrong, that’s perfectly okay! I mean, have you seen the scenery around Paris? But there are some far better options out there. My recommendation is Calife Cafe. This little ship has a changing menu depending on what the chef finds fresh at the market, and ALL the food is made in-house. Or, on deck? Not sure what the term for that should be (captians, help me out here!). The cruise itself (and dinner) lasts about 2 hours, and normally you can board the Calife about an hour before setting sail for a pre-dinner drink. In nice weather, there are even seats outside, on the terrace decks! Bonus: Boat departure is right underneath the lovely pedestrian bridge Pont des Arts (a great little stroll after dinner). Double bonus: the bridge is now back to its former glory after the removal of the ‘love’ locks which were destroying it! 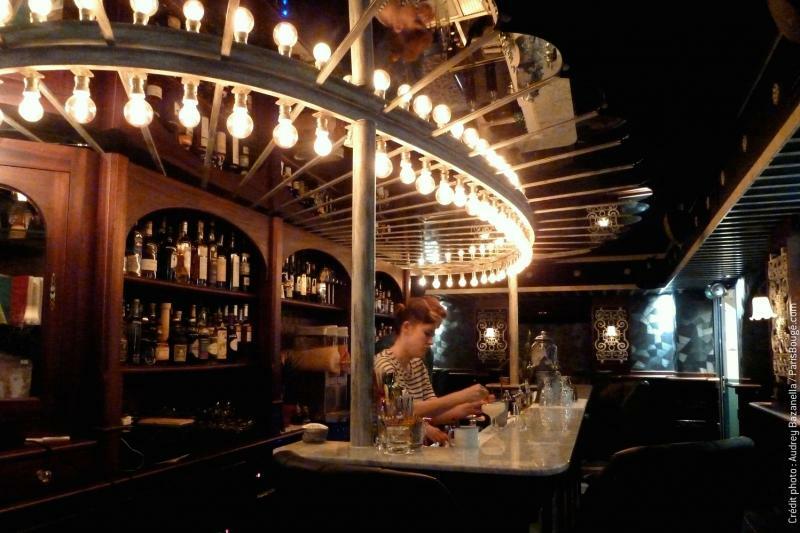 This swanky-yet-cozy prohibition-feel cocktail bar has black leather chairs, intimate booths, exposed bulbs, mosaic-tiled walls, and a backdrop of swing and jazz music to set a cozy, other-era ambiance. You won’t regret popping in for a spell in this cozy cocktail bar. Open: Weekends 7pm-4am, weekdays 7pm-2am. Closed Tuesdays. Bois de Vincennes is an enormous park/forest area on Paris’ eastern side. It’s three times larger than New York’s Central Park, if you can believe it. And you better! Heading to the Bois de Vincennes is unique in that it is such a far cry from the bustle of the Paris that we see all the time. The first part of the park that you’ll encounter from the city is the area around the Lac Daumesnil. Lac Daumesnil is a a picturesque and lovely place, filled with green from the trees and blue from the water’s reflection on the lake. And some little spots of red… rowboats! You can rent rowboats any day of the week from March to November for 13 euros an hour. Row your sweetheart under bridges alive with ivy, past playful ducks and swans, and glory in the peaceful scenery together. Bonus: You get to show off your muscles, right?! …and then take a nap on the soft grass under the shade of a tree. What great and unique ways to have fun with your love one, and hopefully steal lots of smooches. Let us know what your favorite is (and don’t forget the discount on the sweet food tour we mentioned above)! This entry was posted in Paris Activities, Travel Tips and tagged cruise, Dessert, food, romantic, Sainte-Chapelle, Seine, unique, wine. Bookmark the permalink.